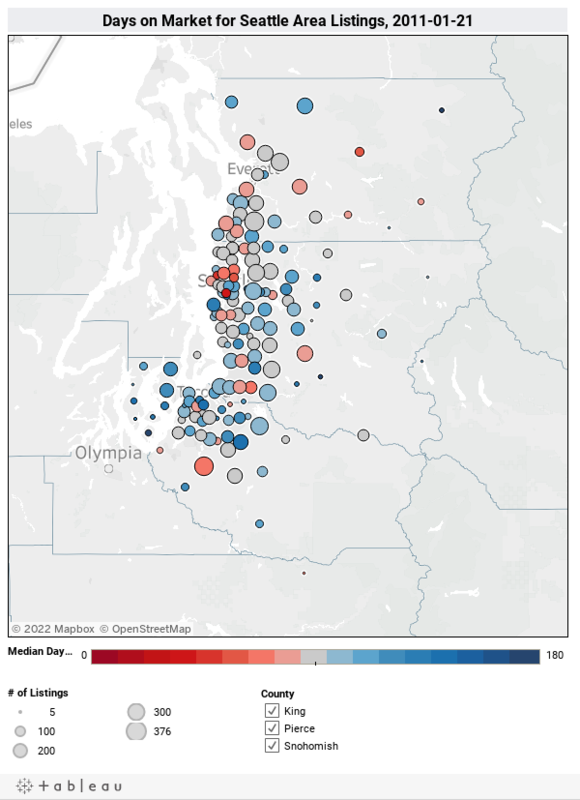 I spent some time this weekend compiling a giant spreadsheet of every active listing in all of King, Snohomish, and Pierce counties, so if you don’t like the interactive Tableau maps, this probably isn’t going to be your favorite week. First up, let’s have a look at a map of the “staleness” of listings. The map below has a circle for every zip code with at least five listings. The circles are sized according to the number of listings, and color-coded based on the “staleness” of the listings. This is based on the original listing date, not the latest time the agent pulled and re-posted the same house. Zip codes near the market-wide median of 92 days on the market are grey, above the median is blue, and below the median is red. Here in King County, Medina (98039) has the most stale listings, with the median days on market coming in at 149. Of the zip codes with over 100 listings, West Seattle (98116) takes the cake with 129 median days on market for its 181 listings. The freshest listings in King County are in downtown Seattle (98101), at just 54 median days on market. The north Seattle neighborhoods of Ballard (98107), Fremont/Greenlake (98103), and U District (98105) all came in well below the median as well, at 55, 74, and 63 respectively. King and Snohomish County both had a county-wide median days on market of 90, while Pierce was slightly higher at 95. Hold off, a better deal is down the road and an even better deal than that is even further down the road. On our present status quo economic planning I don’t see actuals of improvement [except short-term investments, like stocks held up with QEC and even they’re highly risky today] and the heydays of 2006 are gone forever IMO. This isn’t our fathers’ recession, so don’t quote recent history to me, this is a witches brew and uncharted waters. Thank you Tim, I like this kind of data. Problem for us, when we set filters at .5+ acre, and 2250+ sf the CDOM spikes errantly out of control and makes 92 days look like spring chickens. East side of King County by the way. Tim, did you weed out short sales? In your other Tableau™ thingies, 98116 tends to appear in the upper end of sales volume and median price delta. Is there an obvious explanation for the discrepancy I’m missing, other than a possibly high level of short sales? It is not scientific but I am actively looking at new and interesting listings getting ready to make an offer and even in West Seattle most of the “new stock” was delisted in December for the holiday break and is now just relisted at prices close to what I wrote down in December. There are a few new ones but I’m thinking it may be more gaming by the listing agents in some areas? Neither of those property types are selling well. If you just look at SFH under $750K, the inventory isn’t nearly as stale. Tim, there is no such thing as a “non distressed seller” anymore. Every seller I know is far more stressed then the banks unloading REO’s. Ray I think you forgot to take your medicine. Many sellers are not distressed, which is why you are able to make fun of their “overpriced” listings. Every price reduction brings out a few more “distressed” sellers. I think Tim’s just using the “technical” term. Don’t forget to pull up the mortgage records folks! That’s rather basic. Even if the seller has equity you want to know how much equity they likely have. BTW, is there a consumer site that gives mortgage debt information? King County won’t let you look at mortgages. I definitely agree with the North Seattle versus West Seattle comparison and that is what I’m seeing working with buyers. Good first time buyer single family homes in Ballard / Green Lake ($350,000 to $400,00 range and in good condition) are being snapped up quickly with multiple offers. In West Seattle a buyer has a lot more time to investigate a potential property with getting paranoid it will be gone in the morning.